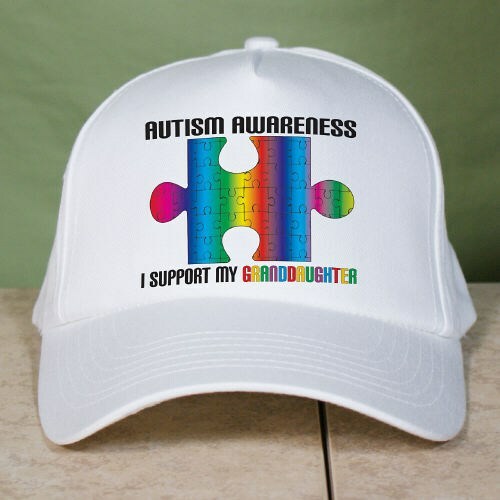 Starting now, you too can be a part of helping millions of people spread awareness of Autism when you wear this personalized Autism support adult hat for men and women. The beautiful and vivid multicolor design represents joy and optimism with interlocking puzzle pieces to show the complexity of this condition that affects so many families. Our Autism awareness products make a perfect addition at your next Awareness Walk event. Please note: 'My' is automatically included before the Any Title personalization. Additional Info April is Autism Awareness Month and it’s the time to get out there and show your support. Get involved and help spread Autism Awareness by participating in activities and walks near you. MyWalkGear.com has created a wonderful collection of Autism Shirts and Walk Gear that is perfect for your upcoming walk event. Take a look at our Personalized Walking for Autism Water Bottle along with our Personalized Autism Ribbon Dog Tag to let everyone around you know that you are their number one supporter.